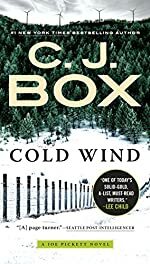 Synopsis (from the publisher): When Earl Alden is found dead, dangling from a wind turbine, it's his wife, Missy, who is arrested. Unfortunately for Joe Pickett, Missy is his mother-in- law, a woman he dislikes heartily, and now he doesn't know what to do -- especially when the early signs point to her being guilty as sin. But then things happen to make Joe wonder: Is Earl's death what it appears to be? Is Missy being set up? He has the county DA and sheriff on one side, his wife on the other, his estranged friend Nate on a lethal mission of his own, and some powerful interests breathing down his neck. Whichever way this goes ... it's not going to be good.